ArtVinyl launches vinyl storage Kickstarter | What Hi-Fi? The Play & Display Flip Frame design for easily storing vinyl records is hoping to follow-up on the success of its 12in storage solution with a new model for 7in vinyl singles. The ArtVinyl 7in Flip Frame Kickstarter is now live, with the campaign aiming to raise £25,000 in order to launch the new model. Memory Box, the company behind ArtVinyl, says the 7in design is a result of demands from its existing base of some 200,000 customers, who have bought the existing 12in Flip Frame, which launched just over 10 years ago. The simple 'Play & Display' design allows you to display your vinyl artwork on the wall and, crucially, easily remove albums without taking down the frame. The pop-out design also doubles as storage for your vinyl, with room for 3-4 singles in each Flip Frame. You can pledge your support for the project from as little as £3 but it's £23 to secure one 7in Flip Frame or £30 for a 12in model. A £60 pledge will get you three Flip Frames for 7in vinyl singles, assuming the project is funded. ArtVinyl has ridden the wave of the vinyl revival in recent years, with projects such as Record Store Day helping to boost vinyl sales. ArtVinyl also hosts an annual award for the best album artwork, which was won by White Lies in 2013. 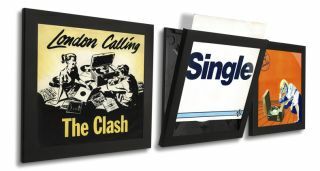 Now it's hoping to see a similar rise in interest in vinyl singles, while also hoping the Flip Frame will inspire people to dust-off their old 7in records and put them on more prominent display. The new 7in Art Vinyl Flip Frame will be on display at the National Audio Show this weekend. Head over to the ArtVinyl Kickstarter page for more information.